Polluted air! Polluted water! Polluted earth! Experts worldwide are frightened. Smog is no longer a joke - it's a killer! Water is unfit for human consumption. Rubbish is burying the civilization that produced if. Sweden is asking the UN to lay plans for an UNPRECEDENTED world porlay on pollution in 1972. Top scientists, technicians and molders of public opinion will try to solve the problem of planetary contamination before it reaches the point of no return! This giant problem affects YOUR life daily. YOU need to grasp the gravity of this crisis - learn what the solution will be! "WE SHALL NEVER have, on a nationwide basis, absolutely clean air or pristine pure water. 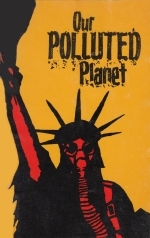 There is a necessary and acceptable amount of each pollutant that society will tolerate." This blunt and rather shocking admission by a leading U.S. Senator was only one of many alarming facts and conclusions presented at the recent National Pollution Control Exposition and Conference in Houston, Texas.